This special home has been truly loved by the current owners, who~ve raised their family in and impeccably renovated the house from top to bottom. 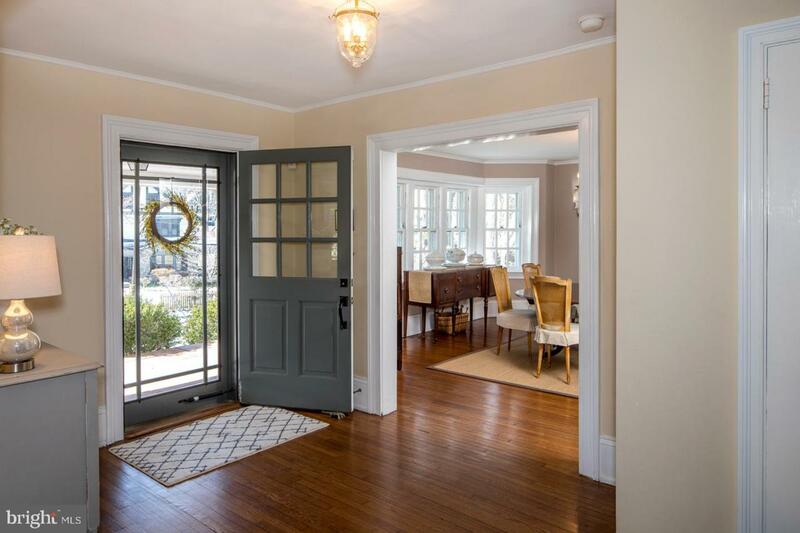 As a result, the traditional 1910 colonial retains its historic charm, yet functions as a modern family dream residence, where classic elements meld with thoughtful updates and design details throughout. 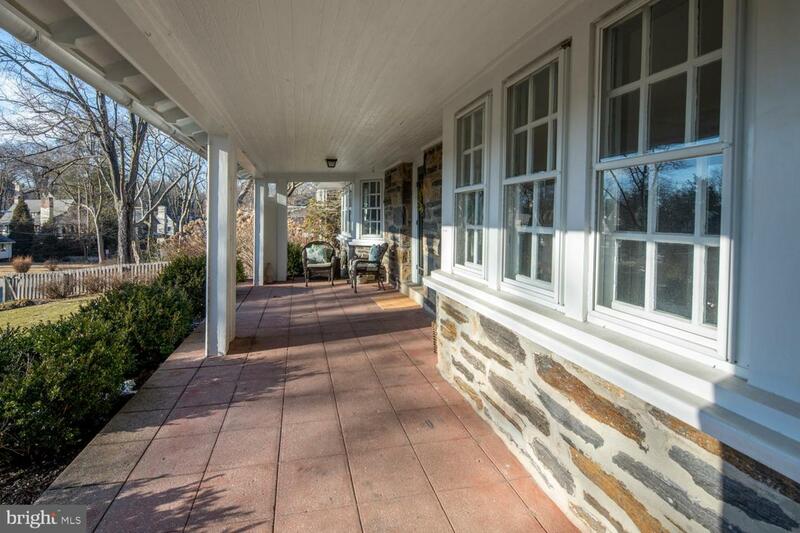 The large covered front porch with 2 sets of fieldstone steps is a lovely place to sit on a warm summer day. 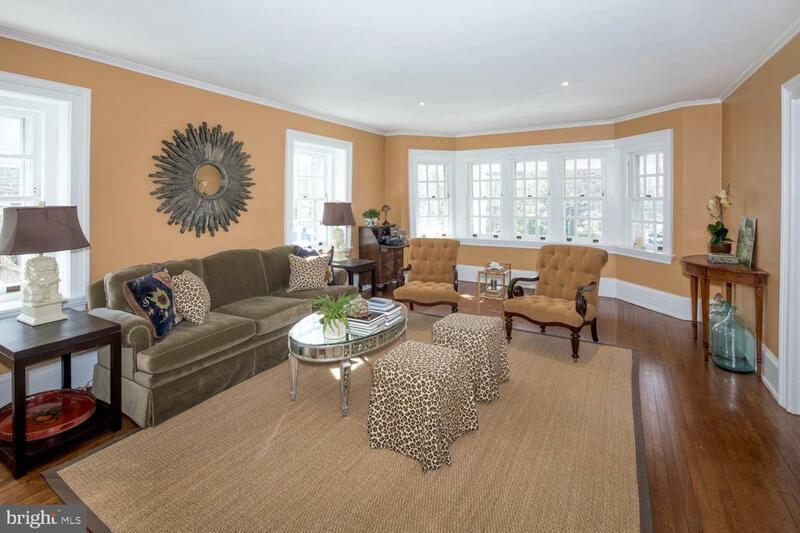 A sunny center hall introduces original refinished hardwood floors, and is flanked by a living room with original stone fireplace and formal dining room that adjoins with the fabulous kitchen. Unlike most older homes, a great circular flow and open layout exists, with all main rooms connected for easy living and seamless entertaining. The big gourmet kitchen styled with quartz countertops, Brookhaven cabinetry, a custom 8~x4~ copper island and top-grade appliances is a chef~s delight, complemented by a 7~-wide floor-to-ceiling pantry. The vaulted open eating area boasts 15~ ceilings and glass-paneled doors leading out to the large fieldstone patio, repointed in 2018. Host a crowd in the awe-inspiring vaulted 15~ family room with reclaimed PA barn beam, a wall of windows overlooking the peaceful yard, and original exterior stone fireplace preserved as an architectural feature. A convenient powder room and mudroom with family entrance and slate flooring round out the first level. Six bedrooms and 3 full baths on the second and third stories provide numerous configuration possibilities suited to your needs, whether for an office, playroom, workout area, in-law or nanny quarters. Unwind in your master bedroom with custom built-in closets and spa bath with Carrara marble accents. Abundant storage is another advantage that~s not typically the norm for a house of this period. A part-finished basement is ideal for kids or teens, with lots of room for toys and games + 2 unfinished bonus rooms with 8' ceilings that could be redone, and a second laundry. The gardens and outdoor spaces are blissful for hanging out, barbecuing, and enjoying nature. A fully fenced backyard, Rainmaker sprinkler system, storage shed with electric, newer one-car garage with storage above, alarm system, dual zone HVAC & more! 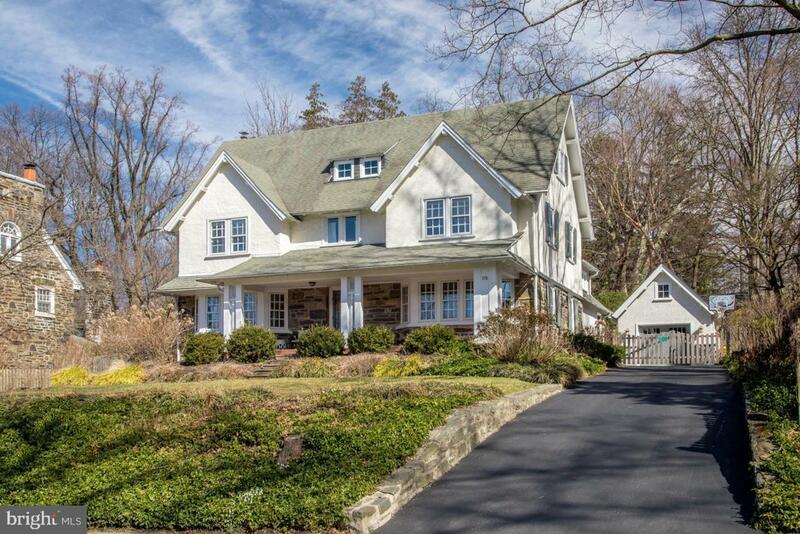 In an excellent Main Line location, walkable to town, the train, Lower Merion Schools (your choice of Lower Merion High School or Harriton High School! ), Suburban Square shops, restaurants, Trader Joe~s, and Ardmore Music Hall. Listing courtesy of Bhhs Fox & Roach-Haverford. © 2019 Garden State Multiple Listing Service, LLC. All rights reserved. IDX information is provided exclusively for consumers' personal, non-commercial use and may not be used for any purpose other than to identify prospective properties consumers may be interested in purchasing. Information is deemed reliable but is not guaranteed accurate by the MLS or Keller Williams Real Estate. Notice: The dissemination of listings on this website does not constitute the consent required by N.J.A.C. 11:5.6.1 (n) for the advertisement of listings exclusively for sale by another broker. Any such consent must be obtained in writing from the listing broker.The data relating to real estate for sale or lease on this web site comes in part from GSMLS. Real estate listings held by brokerage firms other than Keller Williams Real Estate are marked with the GSMLS logo or an abbreviated logo and detailed information about them includes the name of the listing broker. Data last updated 2019-04-20T14:46:23.27. © 2019 Greater Lehigh Valley REALTORS® All Rights Reserved. Based on information from the Greater Lehigh Valley REALTORS®. IDX information is provided exclusively for consumers' personal, non-commercial use and may not be used for any purpose other than to identify prospective properties consumers may be interested in purchasing. Information is deemed reliable but is not guaranteed accurate by the MLS or Keller Williams Real Estate. Data last updated 2019-04-20T18:12:58.497. Listings displayed are not necessarily the listings of the provider. The data relating to real estate for sale or lease on this web site comes in part from Pocono Mountains Association of REALTORS®. IDX information is provided exclusively for consumers' personal, non-commercial use and may not be used for any purpose other than to identify prospective properties consumers may be interested in purchasing. Information is deemed reliable but is not guaranteed accurate by the MLS or Keller Williams Real Estate. Data last updated 2019-04-20T18:12:38.62.©2019 Bright MLS, All Rights Reserved. IDX information is provided exclusively for consumers' personal, non-commercial use and may not be used for any purpose other than to identify prospective properties consumers may be interested in purchasing. Some properties which appear for sale may no longer be available because they are for instance, under contract, sold, or are no longer being offered for sale. Information is deemed reliable but is not guaranteed. Some real estate firms do not participate in IDX and their listings do not appear on this website. Some properties listed with participating firms do not appear on this website at the request of the seller. Data last updated: 2019-04-20T17:53:34.73.